The Ogden Utah Temple (formerly the Ogden Temple) is the sixteenth constructed and fourteenth operating temple of The Church of Jesus Christ of Latter-day Saints (LDS Church). 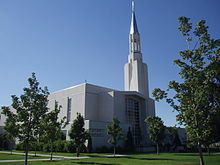 Located in Ogden, Utah, it was originally built with a modern, single-spire design very similar to the Provo Utah Temple. During a renovation completed in 2014, the exterior and interior were extensively changed. The temple was closed for 3 1/2 years to undergo renovations that significantly modified the look of the building. Following an open house from August 1 to September 6, 2014, the temple was rededicated on September 21, 2014. The temples in Ogden and Provo were planned due to overcrowding in the Salt Lake, Manti, and Logan temples. The Ogden Temple serves more than 135,000 members. The intention to construct a temple in Ogden was announced by the LDS Church on August 24, 1967. On September 7, 1970, a cornerstone laying ceremony was held. The site for the temple is a 10-acre (40,000 m2) lot called Tabernacle Square that the church had owned since the area was settled. In 1921, LDS Church president Heber J. Grant inspected the site as a possible temple site, but decided the time was not right to build. At the time of construction, the Ogden Temple differed from temples built previously by the LDS Church. The original design was very contemporary and the lot chosen is in downtown Ogden, surrounded by businesses and offices. The temple in Ogden was the first built in Utah since the Salt Lake Temple was dedicated in 1893 and since Utah gained statehood in 1896. The Ogden Temple was originally constructed with 115,000 square feet (10,700 m2) and four floors, one below ground. The temple included six ordinance rooms and eleven sealing rooms. The stone on the temple was fluted and decorative metal grillwork was added between the stone. Gold windows with directional glass also added to the beauty of the temple. The Ogden Temple was dedicated on January 18, 1972, by church president Joseph Fielding Smith, a few weeks before the Provo Temple was dedicated. Beginning in 2001 and lasting through much of 2002, both the exterior of the temple and the surrounding grounds underwent significant changes. Weather damage to the exterior of the temple was repaired and the spire, which was originally a yellowish-gold, was painted bright white. A fiberglass statue of the Angel Moroni covered in gold leaf was added to the temple's spire, almost 30 years after the temple was dedicated. The temple grounds received walkways and paths allowing visitors to walk around the temple as well as to access the structure from the main adjacent street. On February 17, 2010, the LDS Church announced that the Ogden Temple would undergo major exterior and interior renovations that would significantly modify the look of the building. The upgrades included replacing old electrical, heating, and plumbing systems with more modern, energy-saving equipment. Additional improvements included construction of a new underground parking structure, complete relandscaping of the temple block, and renovation of the adjacent Ogden Tabernacle, including removal of its spire. The interior was reduced from 131,000 to 115,000 sq ft, but through an improved design, there is more usable space following the reconstruction. On April 25, 2014, the church announced that with renovations nearing completion, a public open house would be held from August 1 to September 6, 2014. The temple was then rededicated in three sessions on September 21, 2014 by church president Thomas S. Monson. There are a number of other significant buildings located on the same block as the temple. The first building constructed was the Weber Stake Tabernacle (1855) on the southeast corner of the block. It was demolished in 1971 in conjunction with the construction of the temple. The Weber Stake Relief Society Building, completed in 1902, was located on the western portion of the block. It was deeded to the Weber County Daughters of the Utah Pioneers in 1926, who used it as a pioneer museum. In January 2012 it was moved approximately one block west to a lot donated by the City of Ogden. The move was to accommodate a new parking structure built as a part of the temple remodel. The Miles Goodyear Cabin was located adjacent to the Weber Stake Relief Society Building as part of the pioneer museum from 1928 to late 2011, when it was moved to the new pioneer museum location. The largest of the other structures to occupy the lot is the Ogden Tabernacle, constructed in 1956. The large tower on the north side of the building was removed in the 2010–14 renovation. Ogden Stake Tabernacle, Ogden, Utah prior to removal of tower. ^ "Ogden Utah Temple Will Be Rededicated in September 2014". ^ "Museum History". Weber County DUP Museum. Retrieved January 1, 2015.